On the Road Again, Again! : Back in he U.S.A. Question to ponder: When did the United States of America change from plural to singular? before allowing it to reenter the U.S. Entering the U.S. at a remote point with minimal traffic seemed like a good idea – a charming experience with the same low key approach to life I'd been enjoying for the past six weeks in Canada. Not so. The staff has way too much time on their hands – time that easily leads to mischief. As I drove up to the gate, the officer immediately told me to turn off the engine – not a good sign. As expected, he "asked" me for my passport. Even this is annoying when you consider that I'm crossing a border that used to require nothing more than a driver's license. In modern Europe you don't even slow down from autobahn speed to go from one country to the next. Next the agent started asking questions. Lots of them. He must have found the opening he sought because next he excused himself to round up his colleagues. As they surrounded the Ark he asked me to step outside. I hoped they had been trained in the use of the sidearms on their hips. One took me around back to inspect the firewood. Meanwhile the other four helped themselves to a look around inside – not an inspection – just a gander. Only twice has anyone ever asked if they could see the inside my RV – both at border crossings – both by "officers of the law." Sure glad I made my bed this morning. served me some of the best food on the trip. 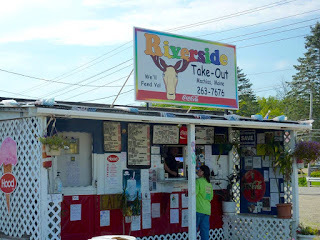 The day's drive took me downeast to the Maine coast. 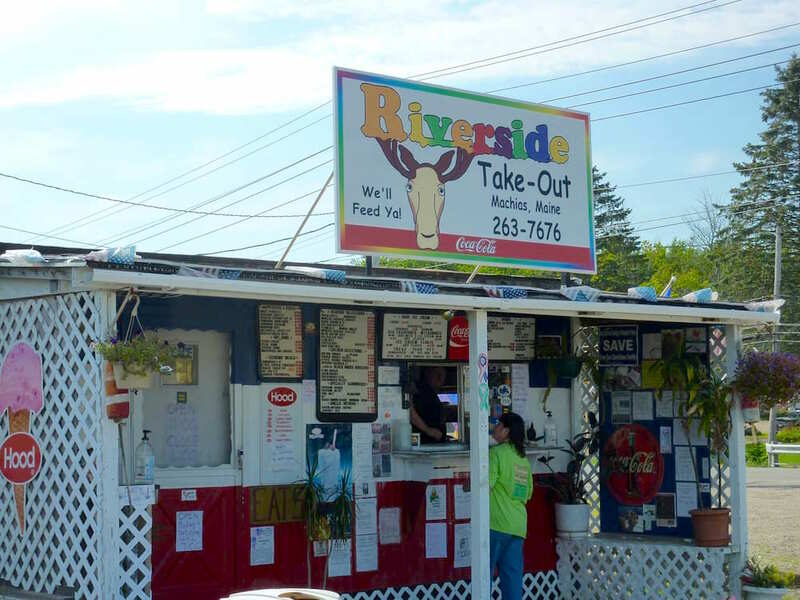 Dinner was at Riverside Take-Out, an unpretentious roadside stand in Machias, Maine. Wow. Great lobster roll – simple, but great. Plus a scoop of blueberry ice cream that tasted like a sundae made with fresh Maine blueberries. Could hardly believe my tongue. 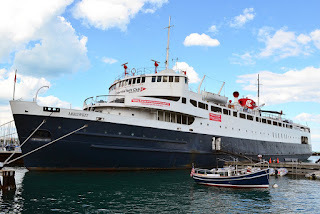 Ice-breaker/rail ferry for 35 years between PEI and the mainland. Now serving Chicago as Columbia Yacht Club. While I savored dinner at a picnic table in the parking area, Penny from Re Find Furniture next door came by to check out the Ark and chat about it. Then she invited me to see the store. Of course I accepted. While chatting with Penny and Kim (the owner) about the Maritimes, I asked if they had heard of the Abegweit. Kim remembered riding on it as a child. 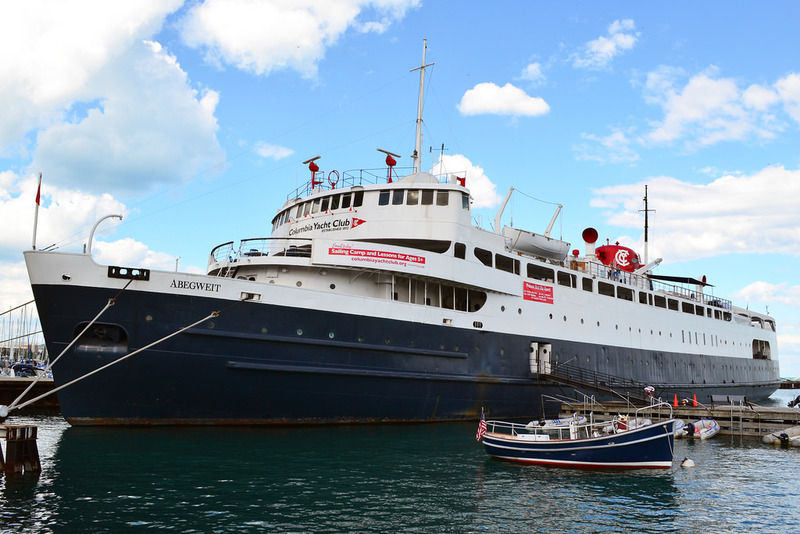 The Abegweit spent her (the Abby's) first 35 years as an ice-breaker/railroad-ferry connecting PEI and the mainland. Since then she has spent 35 years as a prominent feature of Chicago's lakefront, where she's the clubhouse for Columbia Yacht Club. I love discovering what a small world this really is. By this time all I wanted was a place to sleep. I wish I had thought to ask Kim and Penny if I could just boondock in their parking area. Another hour found me at a lovely out-of-the-way place on the bay. While setting up I had a tough time leveling the Ark – one of the jacks wouldn't work. Got out to check. A tire had a hole that you could put your fist through. Ugh. A few phone calls revealed I was too late reach anyone. Story will have to wait 'til tomorrow. What's in North Cape, PEI?